a passion for physical fitness. Flip into your next year with a Tumble Tykes Birthday Party. For reasonable rates you can enjoy the gym to yourselves! Our parties are a fun and safe experience your child will never forget. In addition to our regular class schedule, we offers a day long camp program during Summer & Winter. Your child will enjoy gymnastics, dance, games, music, and arts & crafts. Camp is from 9am-3pm. 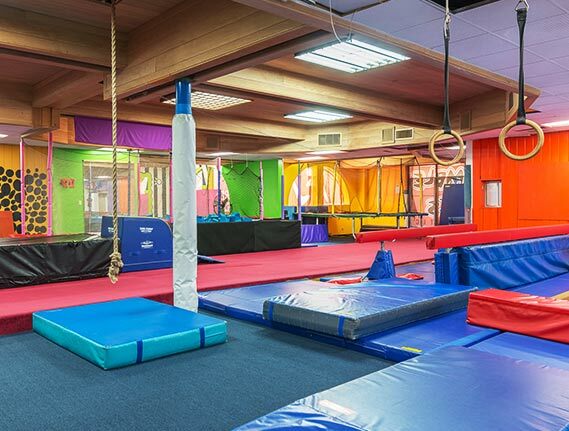 We at Tumble Tykes Gymnastics in woodland hills deliver high-quality gymnastics and recreational programs that foster a passion for physical fitness. We strive to provide an environment that cultivates listening skills, confidence, self, esteem, self-discipline, and responsibility. The balance, coordination, flexibility, and concentration that children learn in their gymnastics classes will help them to succeed either as advanced level gymnasts or in any physical activity they choose to pursue. We believe all children are precious gifts. Every child deserves the best instruction possible and that’s what we strive to give every day. It is very important to us that you and your child have a safe, fun and rewarding experience at our facility. For this reason, we provide and require all students and parents to adhere to our gym rules. Please review all of the following rules with your children; they must understand and abide by these rules in order to have a safe and enjoyable experience at Tumble Tykes Gymnastics. We always check that the equipment we use is in good working order. The floors of our facility are well padded to reduce the force from landings. Mats should be placed under the equipment and properly secured at all times. All our employees knows how to administer First Aid . Our staff is prepared for emergency situations.We are First Aid and CPR Certified as well as USA Gymnastics certified . At Tumble Tykes we do a warm up before each class to keep the children flexible and ready for class. Each coach knows each skill level of each child in there classes.The Children progress on each piece of equipment at there own pace. This insures a safe class for all children. We will store all the Lost and found item for 3 weeks then they will be donated.